ST. IGNACE, Mich. – The bridge that skeptics said never could be built — and gephyrophobics fear to this day – turns 60 years old on Nov. 1. It’s the Mighty Mac, more formally known at the Mackinac Bridge that spans the Straits of Mackinac to connect Michigan’s two peninsulas. An Upper Peninsula Trifecta consists of smooth water, clear sky and a crimson sunset while on a Shepler’s Mackinac Island Ferry evening cruise. Image by Tom Adkinson. Image by Tom Adkinson. Gephyrophobia – the fear of bridges – existed before the Mighty Mac opened in 1957 after 41 months of construction, but the structure certainly made it possible for millions of travelers to know whether the phobia lurked within them. 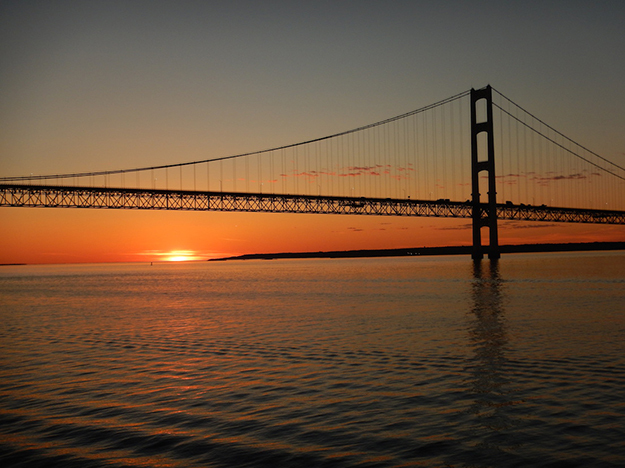 The I-75 roadway of the Mackinac Bridge is 200 feet above the waters that blend Lake Huron and Lake Michigan. Image by Tom Adkinson. Image by Tom Adkinson. When cars and truck began rolling over the bridge, it was the longest suspension bridge in the world. It’s now the fifth longest (No. 1 is in Japan), but it’s still the longest in the western hemisphere. The bridge is a dazzling sight over the swirling waters where Lake Huron and Lake Michigan blend, and its dimensions are astounding. • Its full length is 26,372 feet. That’s five miles. • The suspended portion is 8,614 feet (1.63 miles). • In the middle of the span, the roadway is 200 feet over the water. • Its four-lane swath of I-75 is 54 feet wide. “Whenever I see this great bridge, I think of David Steinman, its architect and chief engineer. He called it the ‘Greatest Bridge in the World,’” said Fred Huffman, group tour coordinator for the Upper Peninsula Travel & Recreation Association. “Steinman designed more than 400 bridges on five continents, and he scoffed at critics who said the bedrock was unstable. He guaranteed the bridge would withstand winds of 200 miles an hour and that its steel and concrete foundation would outlast Egypt’s pyramids,” Huffman said. 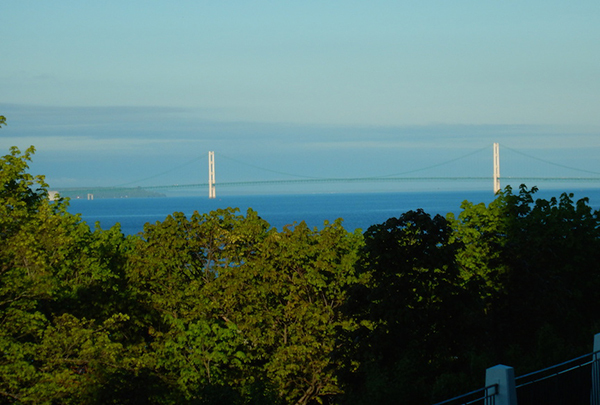 The Mackinac Bridge’s 1.63-mile-long suspended section is visible in full from the front porch of Grand Hotel on Mackinac Island. Image by Tom Adkinson. Image by Tom Adkinson. 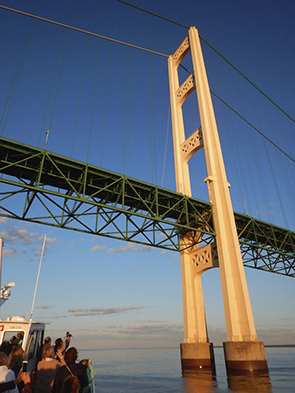 The Mackinac Bridge Authority notes that one reason for Steinmann’s confidence is that suspension bridges move to accommodate wind, temperature changes and weight. Winter storms can be fierce up here on the Great Lakes. The authority said the bridge deck at center span can move as much as 35 feet side to side. “This would only happen under severe wind conditions. The deck would not swing or ‘sway’ but rather move slowly in one direction based on the force and direction of the wind. After the wind subsides, the weight of the vehicles crossing would slowly move it back into center position,” according to bridge authority literature. A popular long-distance platform to view the Mighty Mac is the expansive front porch of Grand Hotel on Mackinac Island, but the best way to sense the scale and strength of the bridge is on one of the special trips offered by the two ferry companies that zip boats through the area. 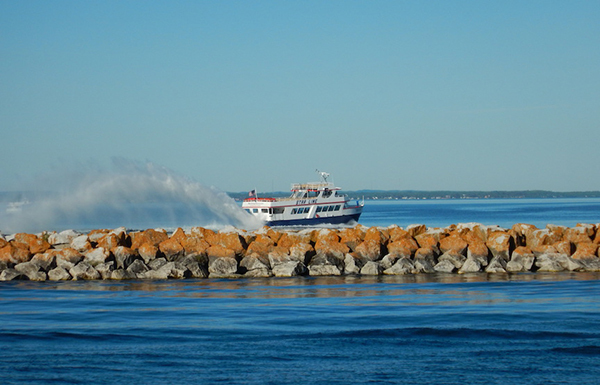 A Star Line ferry creates a rooster tail as it departs Mackinac Island headed for St. Ignace. Image by Tom Adkinson. Both the Star Line Mackinac Island Ferry and Shelpler’s Mackinac Island Ferry have excursions that offer dramatic views and inspire thoughts of how the 3,500 bridge builders accomplished their task. Trip Planning Resource: Trip-planning resources for the land of Yoopers and Trolls: Michigan.org and UPtravel.com.